This week I just had to give credit to Photographer Shawn Miller for Photo of the Week. 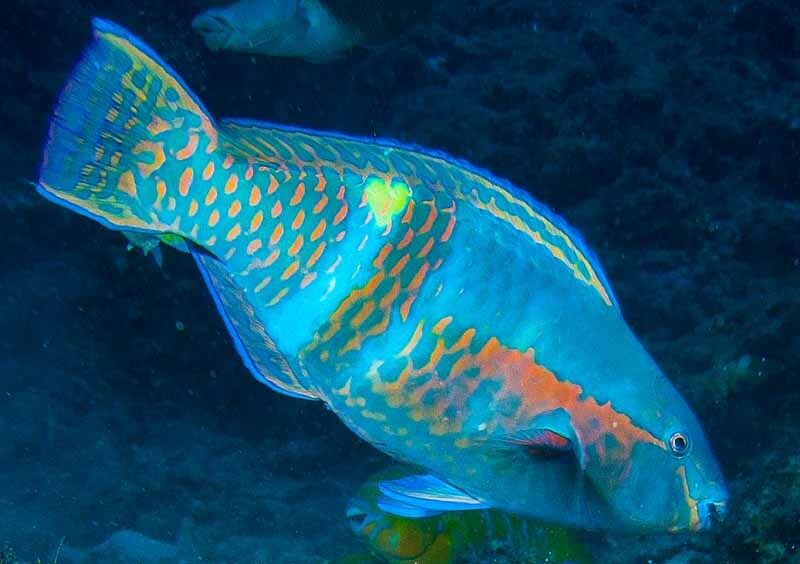 He takes his Nikon D90 with a Tokina 11-16mm lens, a strobe and a camera case for underwater photography and finds things like this Parrot Fish ( Scarus prasiognathos ) with a yellow heart displayed on its side. How deep does he dive to find these critters ? How about 100 feet below sea level ! Visit Shawn Miller's OKINAWA NATURE PHOTOGRAPHY to see more excellent photos taken on and around the island of Okinawa, Japan. "MikesRyukyuGallery.com" has been included in the sixth edition of this years Thinking of Christmas Gifts in July. I hope this helps to attract many more new customers. Shucks, yer all right. Glad to see you posted one of my most popular wildlife photos there. It really is something I should start doing, too; starting my Christmas shopping in July !